Depressed, heart-broken and oh so pissed off Silas is on the run and who knows what he’s up to. As we know from the previous episode “Handle With Care”, Amara is back and is willing to kill Silas to save herself. So much for one true love. At least Stefan has his memory back but is that a great thing? Read the recap HERE! 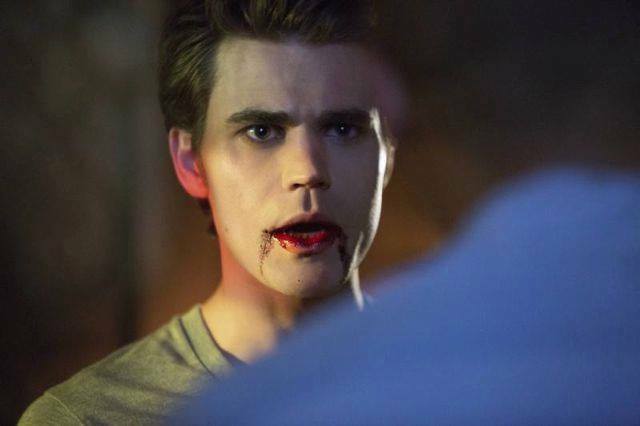 Poor Stefan is remembering all his pains and toils and getting caught up with all the Mystic Fall craziness. Now that they have to keep Amara safe, everyone is waiting for Silas to perform the spell to bring back Bonnie. Fun stuff with Katherine though as Dr. Maxfield runs some tests on her, she’s aging and faster than she knows. According to the doc she’s got a couple months to live. As her daughter goes to college to go find her, the two chitchat it up. Things get weird when Jeremy and Bonnie go to give Amara dinner and she sees and talks to Bonnie. Bonnie and Jeremy get things going as they discuss plans with Elena and Damon about making Bonnie be the anchor so that she can be in both places at once. Though to perform this they would need a witch and this is when Damon goes to Qetsiyah for obvious reason. Filling her in on the anchor swap from Amara to Bonnie, Qetsiyah says she needs something powerful to perform the spell. As Elena tries to make Stefan not kill Silas fearing that it is too dangerous, Stefan details his life in the safe, drowning and trying not to lose hope. To make peace with his emotions, he feels he must be the one to destroy him. Now as Qetsiyah has jumped in on the plan to make Bonnie the anchor, kill Amara and have Silas stay on the other side forever, she has asked to have all the doppelgangers unite. 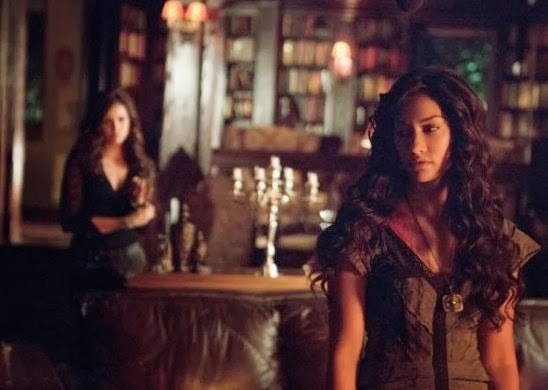 Elena, Katherine and Amara all get together for Qetsiyah as she starts the spell. All seems to be going well until a powerful being, or Silas spiritually interrupts. Silas now in Mystic Falls and in front of Qetsiyah and thrusts a dagger in her. Now as he leaves her to die Stefan calls him to let his know that he has Amara. As Silas finds Amara in the woods, emotions take over and both profess their love. Amara ready to die, begs Silas to kill her, until Stefan comes and the two battle it shortly until Stefan sends a dagger into Silas. Back at the house, Qetsiyah is finishing the spell with Elena. 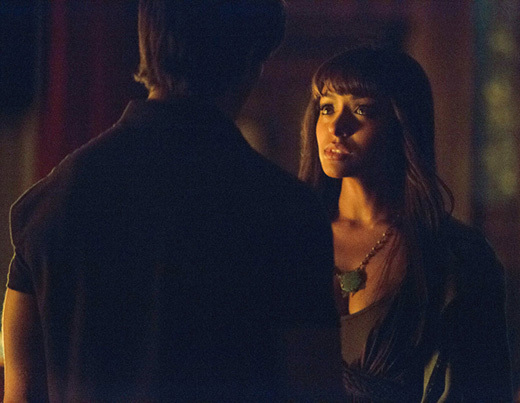 Elena begs Damon to go find Stefan to make sure he isn’t hurt. Little too late, Damon finds Amara in the woods stabbing herself and slowly dying. Bonnie shows up to Jeremy to say her goodbye as she tells him that Amara is dying. Hearts racing, Amara dying and Qetsiyah performing the spell, Bonnie asks Jeremy to tell her the third thing he wanted to tell her. As he goes to touch her, he does! 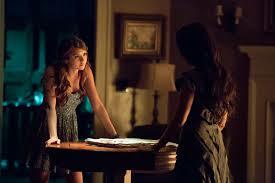 Elena calls her name and her and Caroline run to Bonnie. She’s back! But wait, is there a catch? Now to the catch, as Bonnie is now back, Tessa/Qetsiyah appears and tells her, now that she is the anchor every living soul that dies will run pass her, she will feel every single death and it will hurt like hell. Are you kidding me right now? Poor Bonnie. Caroline goes back to school and tells Katherine that she must move out, a poor aging K is miserable and ready to pack her bag when her daughter shows up again and tells her to go with her back to Prague. Katherine rejects her invitation and tells her that she will never see her again. Elena and Stefan have a discussion in the woods about Elena feeling guilty about being happy the past summer while Stefan was miserable. He claims that he wanted Elena to be the one that would rescue him, and Damon. As Stefan buries Silas, thoughts of his misery and being drowned in the safe come back to him and he collapses. Thinking it was supposed to be over once Silas was dead he gets worried. Next week we deal with Stefan still feeling Silas and the emotions that he desperately wanted to end and Bonnie’s new life as the anchor to the living and dead. What were your thoughts on this episode? Think Silas is really gone? 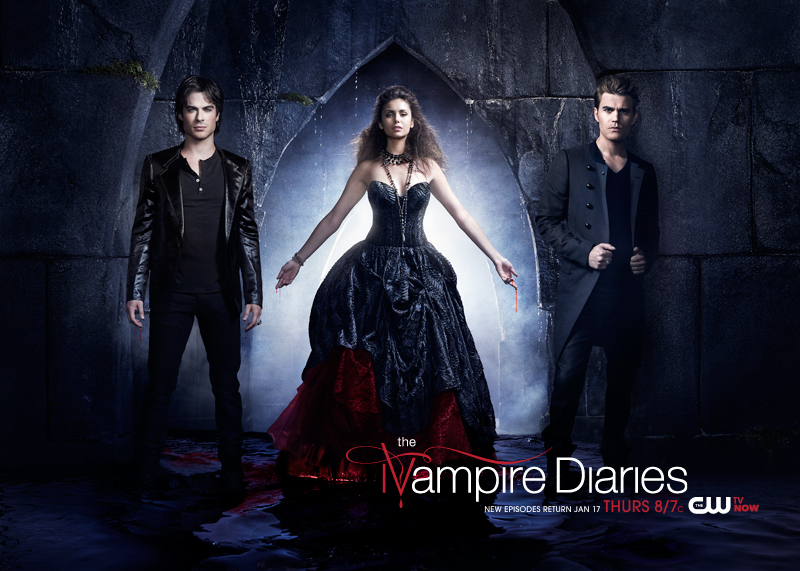 Vamps be cray and this week’s The Vampire Diaries is just an example of how much crazier things can get in small towns. Last week we found that Stefan has lost his memory due to the return of centuries-old witch Qetsiyah and her desire and need for revenge against her one true love Silas. Silas chasing after Katherine, who was taken by travelor Nadia, was intercepted by Qetsiyah’s spell she was performing through Stefan. Bonnie struggled to deal with death and for a moment in time had Matt on the other side to keep her company. With so many ups-and-downs we did discover that Katherine cannot be killed due to the fact that the blood that runs through her veins is the one thing that Silas wants – the cure. Now as Remembrance Day is upon Mystic Falls, that can only mean one thing – trouble. As dear bro Damon is working as story-teller to recap Stefan on the past centuries of his life, Elena tries her luck on reminding him of who he was. As sparks start to ignite between Stefan and Elena an almost kiss happens, I’m squealing with excitement, Elena pulls back to remind herself, and Stefan, that she is with Damon, something that they had neglected to inform him. Matt, worried about his sudden blackouts and loss of time, sets up camera’s around his house to figure out what is wrong with him. As we all know Nadia has bestowed a passenger inside of him. Face to video with his “other self”, things get eerie when he gets a threat from the passenger. Stefan, drunk and in ripper state goes through complexities in his head about what the point of being good and well-mannered is when all is lost for him. 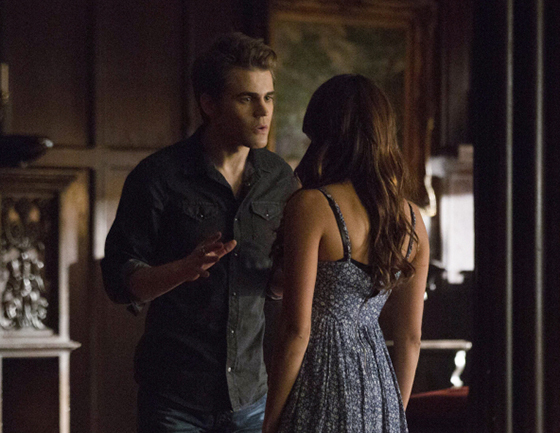 Caroline helps Stefan come to somewhat of his senses after he almost rips new hottie Jesse’s throat off. Only to go back home to the Salvatore estate to tell Damon and Elena that he no longer wants to be the man in his journals and live there. Jeremy finally lets out the truth about Bonnie being dead, first telling Damon, who then has to tell Elena who has to tell Caroline. Elena distraught with the idea of Bonnie being gone feels obliterated and her emotions take over. Caroline finds console in the hands of Stefan who recognizes the fact that she is the only one he can trust in his new memory-less life. Bonnie reminds us that she is not going anywhere and even though they can’t see her, she is always with them. Yes, at this time I am crying like a baby as she tells everyone how she feels. Then SHUT THE FRONT DOOR, Tyler returns! Five heart breaking friends, and Damon, mourning over their best friend’s death. Of course the story can’t move on without a little something, something to keep us on the edge of our seats! As we see Jesse getting checked by Dr. Maxfield he informs Jesse that he has vampire blood in his system and let’s him know what is to come! Shocked and confused Dr. M. does the unthinkable and kills Jesse to obviously make himself a newbie vamp! Next week should be quite an episode with Damon wanting to work with Silas and the beginnings of a new life for Jesse. Also is Tyler here to stay?? What are your thoughts on last night’s TVD episode?